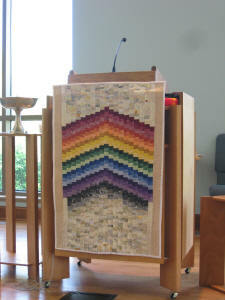 Worship services at Unitarian Universalist Congregation are built around themes such as Grace, Forgiveness, Reaching Out, Hope, etc. Each service is unique. Some of those themes relate to our UU heritage, some to our principles and values, some to important social justice issues. Our services are led by our minister all but one Sunday a month, August through early June, with guest speakers and our own members filling the remaining Sundays. A lay Worship Associate assists with the service each week. This is an exciting time for us, and there is great energy in our Sunday morning services. Many sermons address the large questions all humans struggle with about how we live our lives. Services are held each Sunday from 10-11:15 a.m. Children join their parents in the sanctuary for the first portion of the service before leaving for their Religious Education classes. Early in the service we light our chalice, the symbol of our faith. Our love of music is expressed through the singing of hymns, the beautiful voices of our choir, musical interludes by our talented pianist, members, and guest musicians. The focus of the service is the sermon, but we also include time for silent meditation and reflection, sharing of our joys and sorrows, readings, and the lighting of candles to reflect what is in our hearts. Following the closing hymn and benediction, we gather in our social area, Elarth Hall, for coffee and conversation. On the second Sunday of each month, we share food and fellowship at our Second Sunday Potluck. Listen to podcasts of past sermons.